Just received my copy of "Death to the BCS" in the mail and can't wait to read it. I'm in the midst of two other books right now but this book has already jumped to 2nd in my Non-Fiction book list. It's right behind "Moneyball." I know I can't believe I haven't read Moneyball yet either. You too can check out "Death to the BCS" by clicking on that link. 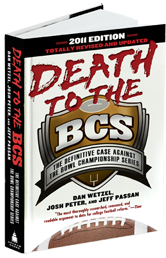 Death to the BCS: The Definitive Case Against the Bowl Championship Series, from award-winning reporters Dan Wetzel, Josh Peter and Jeff Passan, turns the system inside out and finally gives answers as to why the corrupt system remains in place — and exactly how to get rid of it.